Firefox 3.6 has already reached the pre beta releases. And those who can't wait to give this all new Firefox a try in Ubuntu, this is what you need to do. Update: Firefox 3.6 final is released. 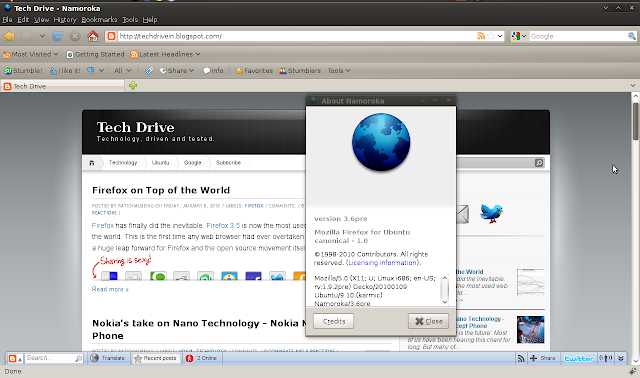 Install Firefox 3.6 in Ubuntu using Ubuntuzilla. Ubuntu Karmic users, this is all you need to do. First of all, you need to add the mozilla-daily PPA. Goto Terminal and copy-paste the following. Again, do the following in Terminal. Let me remind you, Firefox 3.6 is still in its pre beta stages and should contain a lot of bugs. But I guess, it does worth a try.